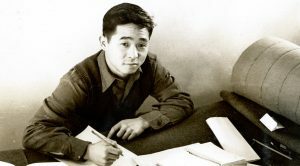 Kazuo Yamane, a veteran of World War II, was one of many Japanese-Americans who served their nation despite widespread discrimination against Americans of Japanese descent. As a master sergeant in the 100th Infantry Battalion (Separate), primarily a Japanese-American military unit and later the Military Intelligence Service (MIS), Yamane’s story of duty and self-sacrifice embodies what it means to be a Soldier in the United States Army. 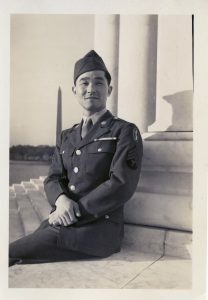 MSG Yamane was one of three brothers to serve in the MIS; another brother served with the 442nd Regimental Combat Team. MSG Yamane was sent to Camp Ritchie, Md. to help establish the Pacific Military Intelligence Research Section (PACMIRS). In 1944, while at work sorting through crates of papers captured at Saipan, he discovered a highly classified document that contained inventory of Imperial Japanese Army ordnance, with detailed descriptions of all the armaments in the Japanese inventory and locations of arms, ammunition depots, and manufacturing plants in Japan. Yamane’s discovery gave valued targeting information for the Allied aerial campaign against Japan. MSG Yamane and two other MIS Nisei Soldiers were assigned to Supreme Headquarters Allied Expeditionary Forces (SHAEF) in France and given the task of conducting a covert mission into Berlin with a detachment of British commandos to collect documents from the Japanese Embassy. When the mission was cancelled the team members were sent to different parts of Europe. MSG Yamane was in Yugoslavia on V-E Day. Their gift places Ms. Yamane and Mr. Waite in the Museum Capital Campaign’s Three-Star Circle of Distinction. *Japanese term meaning “second generation” used to specify children born in the United States or Canada to Japaneseborn immigrants.